Are you living where you drive on the right and moving, or considering holidays to a place where they have left-hand drive, like Great Britain, Hong Kong or Japan? Or the other way around? Here are a few strategies to make driving on the "wrong" side of the road safer. 1. If you don't do anything else, drive the car that is built to match the road. A few years in a row, we took my dad's camper van from its peaceful parking lot in Holland (where they drive on the right), and took it across the Channel to England (where they drive on the left). When the van finally expired (it was 30 years old), we would rent a car in Holland, stuff it with camping gear, and take the ferry to England. I would be driving a familiar car (at least one with the steering wheel on the left side of the car) - but driving on the curb side turns out to be unnatural, and horrifically difficult. You don't have a good overview of the road, and you really must have someone in your passenger seat to be your extra eyes. There is a much better way: I found out when one summer we decided not to camp, but to rent a cottage. Free of camping gear, we took the ferry as foot passengers, disembarked in England and rented a car. 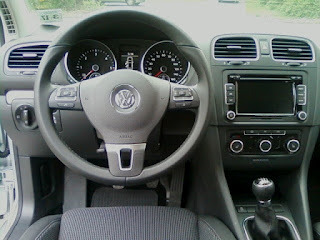 An English car, one with the steering wheel on the right side of the car. The correct side for English roads! For one, I was now on the correct side of the car, closer to the centre line than to the curb. I could see everything and never needed help merging from the on-ramp into traffic, or making a right turn (which is surprisingly difficult if you're on the wrong side of the car). It takes about a day for me: then my brain's software kicks in and kind of performs a mirror-image transformation on my driving, and by the second or third day sitting on the right side of the car and driving on the left feels - believe it or not - natural. 2. Rent a car with automatic transmission. Inside the US, it is nearly impossible to rent a car without automatic transmission. Outside it, it's the other way around. So there are a few things to keep in mind: You can rent automatic cars, but they tend to be larger, more luxurious cars with higher emissions. They're more expensive to rent, more expensive to run, and it's harder to get around on the narrower streets - not to mention finding parking. You probably need to reserve well in advance, simply because there are usually a limited number of auto drive cars available. You may decide that the safety afforded by the automatic drive trumps these disadvantages. The automatic transmission really does take away a huge part of the risk. But if you feel up to the standard drive adventure, there are ways to transition more safely: read on! 3. Rent your car in a small town, not in large city. Getting going in a strange large city is difficult, even if you drive on the usual side of the street. Even with GPS wayfinders, the hectic pace of city traffic is not conducive to a peaceful start of your trip. It's easy to stall a car when you forget what side the stick shift is on. To add to the sweaty-making stress, a rental car is perceived as a local car, so the natives tend to cut you less slack when you hold up traffic, say, by stalling in an intersection. A few times now we've taken a train to a smaller town, where things are more laid back and you have quieter streets and roads on which to get used to the new arrangement. This makes the transition much easier. 4. The first time, rent where you have a decent chance of finding the way. This is another motivation for renting in a smaller town. Whatever you do, don't start driving on the other side of the road in a larger city where you don't know the way, in a place where you can't read the road signs. At least not all at once. Like I once did. 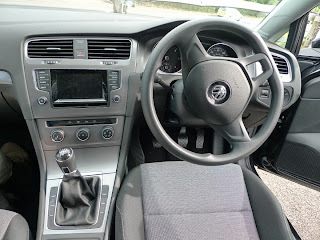 The very first time I rented a left-hand drive car was in Kochi, Japan. It's a medium-sized city (pop. 500,000) but I had never been there and didn't know the way. I couldn't read the road signs. And they drive on the left. It was probably a stupid thing to do, but the plan was to leave town immediately and stick to smaller country roads. So, after I had put my signature on a rental document that I couldn't read, my then-boyfriend (now CelloDad) folded himself into the tiny car (the one we could afford). I got in behind the wheel and eased the car out of the parking lot, catching in the rear view mirror the sight of three rental-car employees bowing after us. This was way before the GPS era. We had in the car with us three identical maps, given to us by three separate people who had each highlighted our route. Even though there really weren't all that many main roads on that island. We had started making jokes about how Japanese people didn't have a high opinion of gaijin (foreigners') intelligence, but once we actually hit the road it became clear just how hard it is to find your way around a Japanese city if you can't read the signs. Imagine navigating by this sign - without the English. Outside of Tokyo very few roadsigns have the English translation. What foreigner would dare to brave those roads in a car on their own, anyway? CelloDad would study the road signs, match the Japanese kanji to the equally indecipherable ones on the map, and tell me which lane to choose. He got it right most of the time. But it was a nerve-wracking experience. I'm not sure he would be up for it now. 5. Breathe deep. Not everything is flipped around. Really, the big change is the position of the shift stick: but the arrangement of the gear box remains the same: first gear to the left, higher gears to the right. The order of the pedals is also the same: clutch on the left, brake in the middle, gas on the right. (If it weren't, that would be a nightmare). So in fact, mostly of what happens on your first drive on the "other" side is that you bang your hand on the door a lot, looking for a shift stick that now should be operated with your hand that's on the middle of the car. This only happened to me on the first trip. On subsequent trips my body remembers, and kind of eased itself into the "other" driving mode. No more banging into doors. 6. Breathe really deep. Slow down. Ask yourself (and answer honestly): Do you really need that car? In most places in the world, the car is far from the only means for mobility. In many places, public transport is a marvel, reaching even the remotest villages, and the obscurest fossil beaches. All you need is a bit of extra time to get where you want to go. (In the case of high speed trains, you even get to your destination faster than by car). You get rewarded with getting to know a place the way you couldn't in a car. You get a glimpse of how the natives get around. And maybe you'll get to meet a few. Isn't that what travel is about?